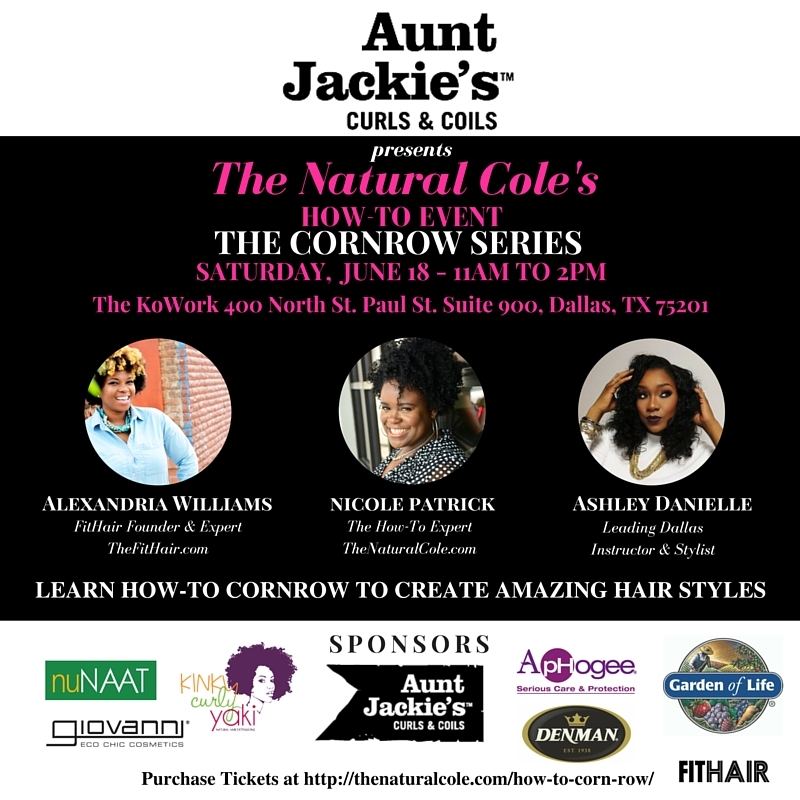 I am so excited to announce, The Natural Cole, my hair stylist Ashley Danielle and my company The FitHair, teamed up to help women learn how to cornrow and take care of their hair from the inside out – Again. Just a few months ago, we hosted the first How-To-Cornrow event and by popular demand those of you who missed out on the event we are bringing it back and much much more! If you want to learn how to do some awesome popular styles like one of my favorites Crochet Sengalese Twists, you don’t want to miss this event. I am excited to announce Garden of Life as one of the Brand sponsors for my section on FitHair, from the inside out! This class will teach you the proper way to corn row, provide hair care education and discuss products to help with this styling technique. My new company The FitHair will be hands on sponsor making sure your feed with a few appetizers, drinks and more that are aimed to help both your body and hair from the inside out. I founded The FitHair as a way to chat about the latest in wellness and help inspire a healthy hair from the inside out. From hairstyles to the gym to healthy recipes and foods you should eat, TheFitHair.Com will keep you in tip top shape from the inside out. So sad I’m going to miss this one!